With apologies for any inconvenience caused, this talk is a substitute for the previously advertised talk on Sacrificial Women: from Virgil’s Dido to Anna Karenina. 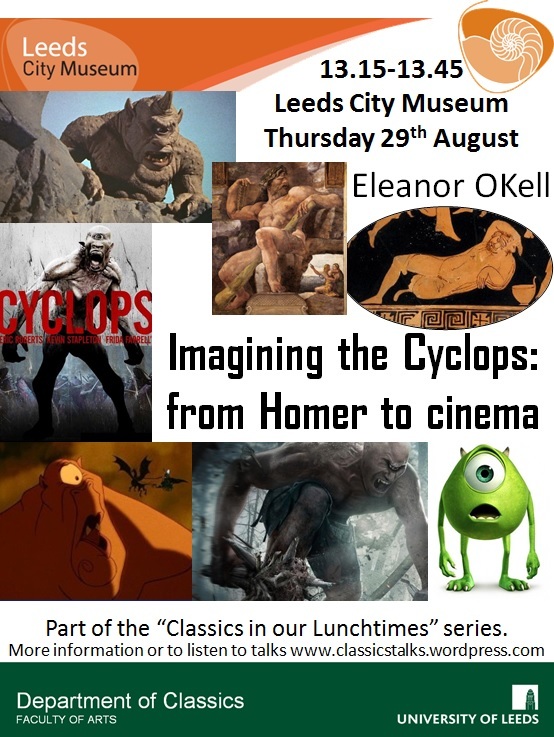 Eleanor OKell, expert on cinematic Cyclopes due to an early enthusiasm for the stop motion animation technique of Ray Harryhausen, turns her attention to the Cyclops’ transition from imagined character to visible character linking its development to increasingly sophisticated solutions to the technical issue of its single eye and to the desire of its creators both to incorporate their cyclops within a tradition and to stamp their own mark upon it. The material expands on earlier versions of this talk (e.g. her 5 minute Bettakultcha presentation) to include the film Wrath of the Titans (2012), but does not contain spoilers for those looking forward to finding out what the cyclopes are like in the Percy Jackson: Sea of Monsters film currently in cinemas (released 7th August 2013). With apologies to those who wished to listen again online, I’m afraid that due to a technical hitch this talk did not record properly. A re-recording will not be made because the talk was a late substitute intended so that audience members could still attend something if they wished rather than it being a planned part of the programme. Many of the slides cannot be made available online due to copyright restrictions, so there is no PowerPoint uploaded either.